Don’t be mislead by the small size of Østerlars Church – this small building holds amazing values of art and history and… also some enticing mysteries. 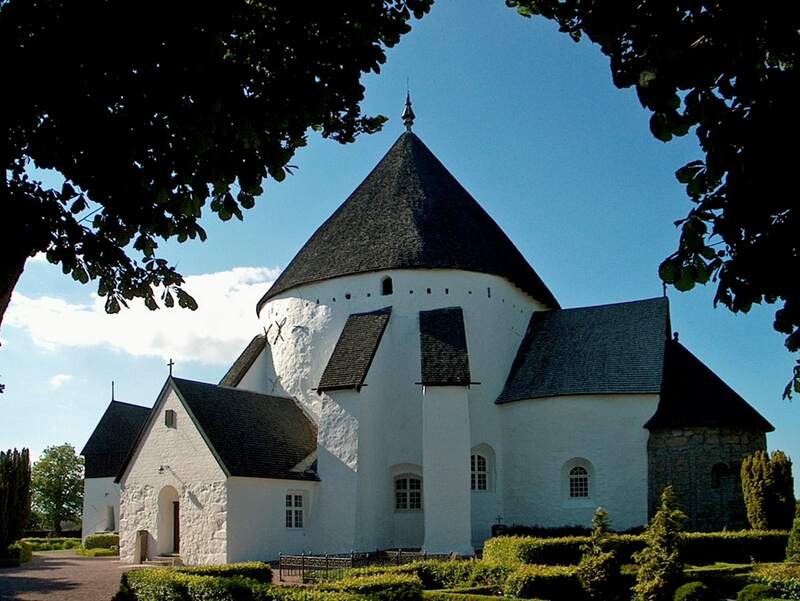 In total there exist 10 such round, fortified churches in Romanesque style, all in Denmark and Sweden. Round churches though exist in Germany, Hungary, Italy and other countries as well. In the same 12th century several round churches were built in England, including the temple in London, constructed by the Knights Templar. All these round churches though are different – they did not serve as fortifications. 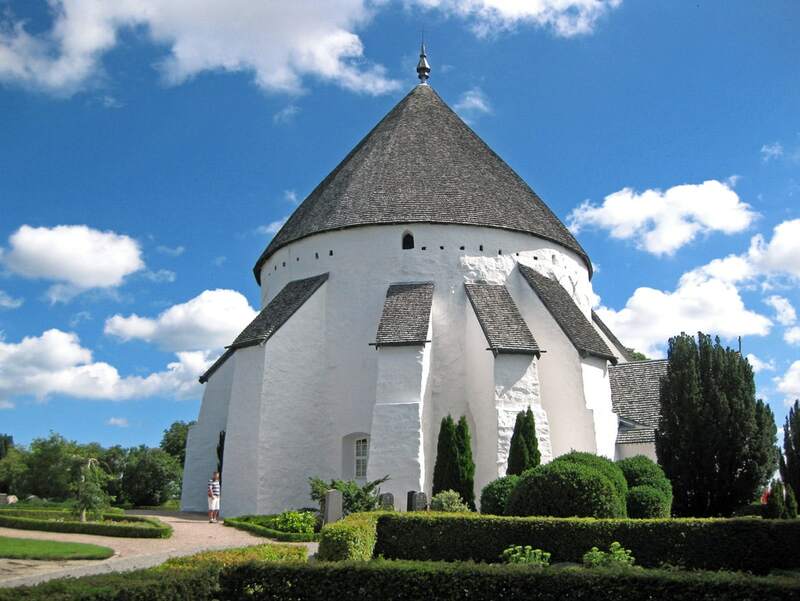 Thus – it seems that the concept of the Scandinavian round churches – fortified refuges of Christians – is unique. Unfortunately we do not know who ordered the construction of Østerlars Church and the three other round churches in Bornholm, it is also not known when exactly did this happen. Coins on the floor of Østerlars Church were minted in 1157 – thus it is assumed that the church was constructed some years afterwards – around 1160. This was the time when people of Bornholm were just Christianized. Church was devoted to Roman martyr St. Lawrence. The Danish version of his name is Lars. The present name was coined in the 17th century, when "Øster" (eastern) was added in front of "lars" in order to distinguish this church from the nearby Ny-Lars (New Lawrence) church. It seems (but – who knows for sure?) that round churches primarly served as refuge sites in a case of attack. Thanks to the round form these buildings could withstand the attacks of battering rams, these churches were impenetrable to the weapons of those times. At the same time the round churches are located in places which are not that easy to defend. Nature of Bornholm offers much better possibilities for fortifications – e.g. hilltops. Before attacking the church itself, intruders had to pass the outer wall – fortification around the churchyard. People entered the churchyard through the square gate tower which served as a bell tower – this tower stands here up to this day. 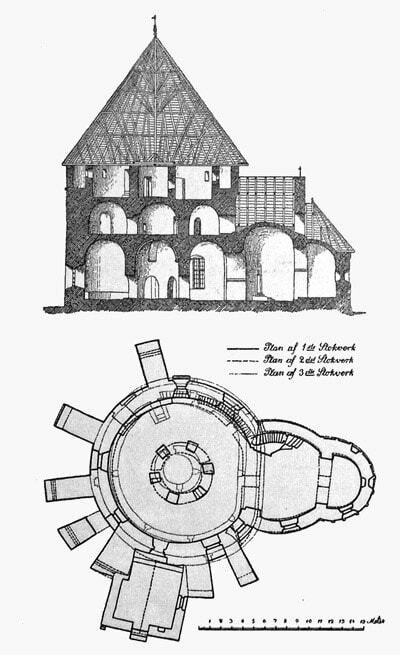 In the beginning the church was a simple, round tower without its current conical roof. External diameter of this tower is 16 – 17 m, inner diameter – 13 m. Tower stands on the limestone cliff, on massive foundation of huge boulders. Walls of the church were built of round and split boulders. Tower has three floors. First floor serves as a church, second contains shelter rooms and third originally was an open watchtower with shooting gallery and walking parapet. The conical roof on top of it was added much later – in 1744. But – even if intruders managed to enter the church, the defenders had one more fortification wall inside the church. In the middle of the round church stands massive, 6 m wide column with a hollow inside. One can enter through an entrance – "oven" – into this column. This hollow continues up to the spire of the church. 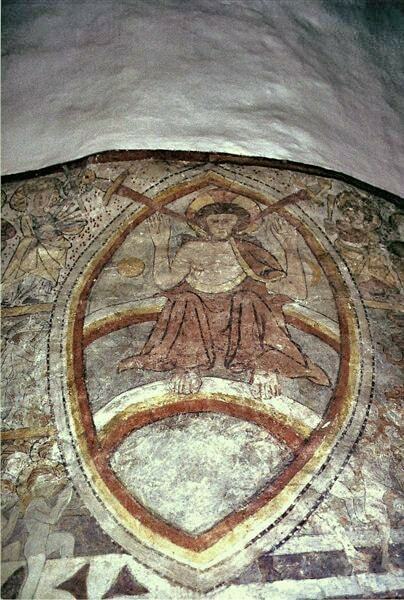 Medieval Danish churches are renowned due to their interesting frescoes – kalkmalerier. These colourful, amazing drawings excel in the pure white interiors of Danish churches, adding a special elegance to the rustic Romanesque and Gothic structures. Østerlars Church has some of the best and most interesting kalkmalerier in Denmark. These drawings were made sometimes around 1350 and later, in Reformation times, whitewashed. This in a way has preserved this value of medieval art. Frescoes have been discovered in several parts of the interior, but only one frescoe – a wide frieze around the central column – has been renovated, while others are hidden under the white chalk. Drawing was uncovered in 1882 and restored in 1889, then again – in 1960 and 2005 – 2006. Frescoe shows biblical scenes from the Annunciation through to the Passion. 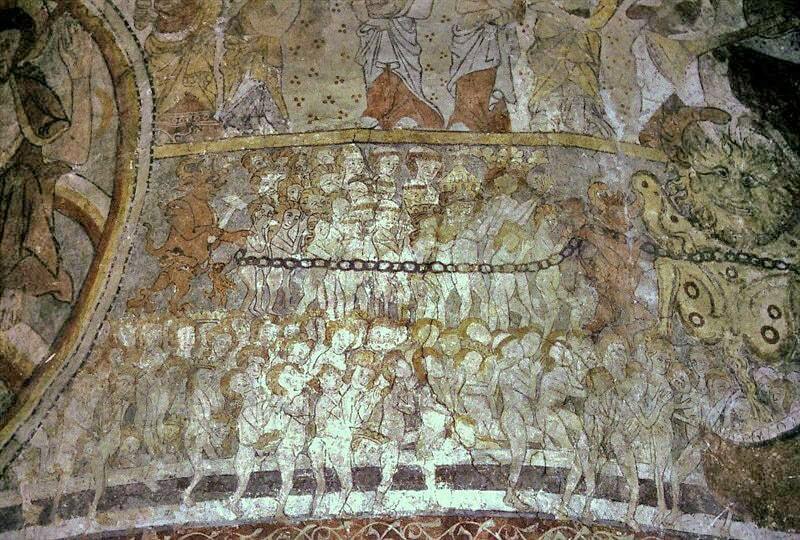 Approximately one half of the frieze is taken by most interesting depiction of Doomsday, with more than 150 people shown in it. Central position in this drawing is taken by Jesus himself. This depiction has even some similarities to Buddhist frescoes with its unusual, surprising symbolics. Doomsday in the drawing is on-going in full scale. The dead are crawling out of their graves and Jesus is judging them. Most people (including some clergymen) are sent to hell, symbolized with a huge dragon. Only a few are permitted to heaven. 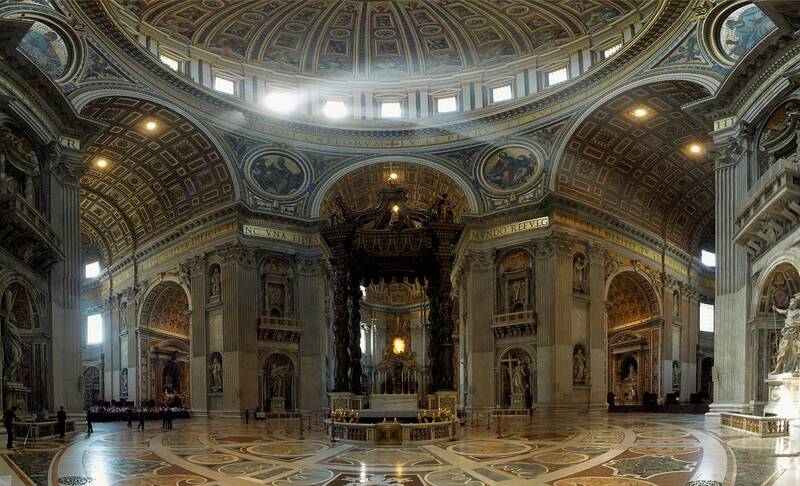 As the centuries went by, the church was changing. The original small windows were hewn larger after the Reformation. In the 16th and 17th centuries there were built 7 massive buttresses around the church to support the outer wall. In 1744 was built the current conical roof, but in 1870 – the porch. Here are found also two runestones. One, from around 1100, stands in the porch and another, from around 1070 – outside the porch. Secret base of Knights Templar? 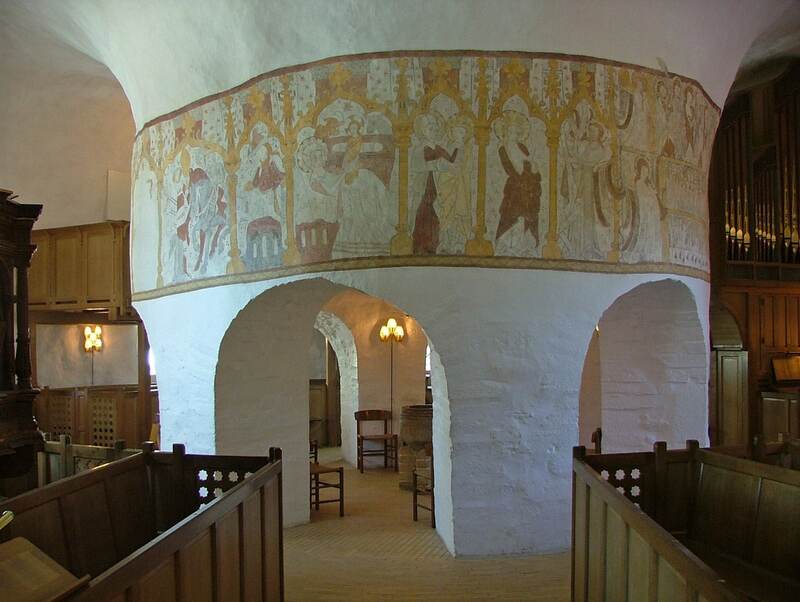 Journalist and writer Erling Haagensen believes that round churches of Bornholm were created upon the wish of Knights Templar and their location is specially selected to form a five-pointed star (with most points… in the Baltic sea). In the early 1990s he produced TV series but in 2000 he published a book "The Templars Secret Island", written together with explorer Henry Lincoln. Haagensen considers that these fortified churches were built as safe storage sites for supplies of crusaders to Eastern Baltics. Two independently made geophysical studies by Haagensen confirm that under the church is located a large cavity. This would not be something extraordinary – many medieval churches have crypts. But – this crypt (if it exists) has not been accessed yet – at least not officially. While the society of Bornholm was in debates whether this cavity should be explored or not, somebody tried to carry out a "research" – in July 2008 some unknown people made two holes in the floor of the church. Østerlars Church with its special charms and mysteries is one of the main attractions in Bornholm, visited by some 100,000 people every year. It seems, the interest in this jevel of medieval architecture and art has rised since the craze of "Da Vinci Code" started. Østerlars Kirke. Website of the church in Danish, with rich information about the past and present of this church. Accessed on May 28, 2012. The picturesque Bornholm island is located between Sweden, Danish mainland, Germany and Poland, at the European crossroads in the Baltic Sea. As a result this island has distinct, own style in architecture and culture, which is influenced by many cultures. 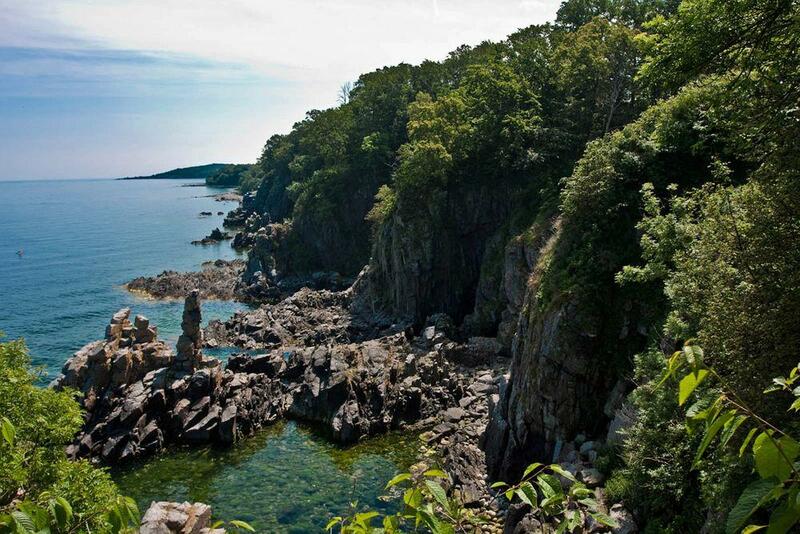 Does the remote Baltic island of Bornholm hold the key to an ancient secret? A secret that links it to the enigmatic village of Rennes-le-Chateau in the French Pyrenees and the tunnels beneath Mount Sion in Jerusalem? What is its connection with the Templar Knights, and what were they trying to hide on such a distant isle?